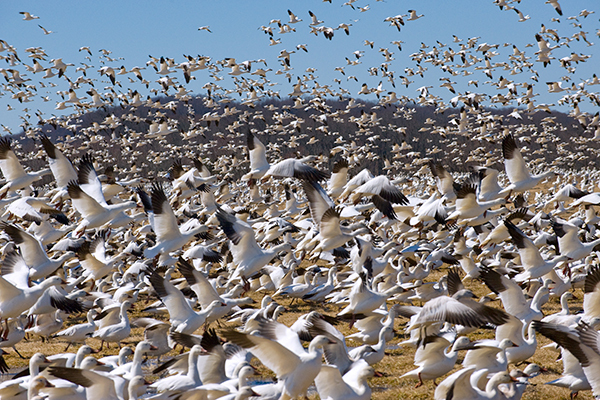 With spring comes the annual snow geese migration.Every once in a while they take to the air in large numbers as shown here. 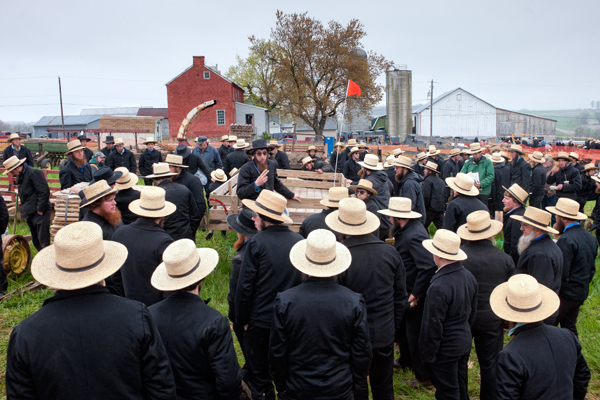 I shot this image last year during one of the counties many mud sales,which get their name from the usual muddy conditions in spring.I will be posting more sporadically for a while because I cannot keep up with posting everyday.This group of Amish men are bidding on farm implements. Another surprise roadside scene we came across on our new england trip. 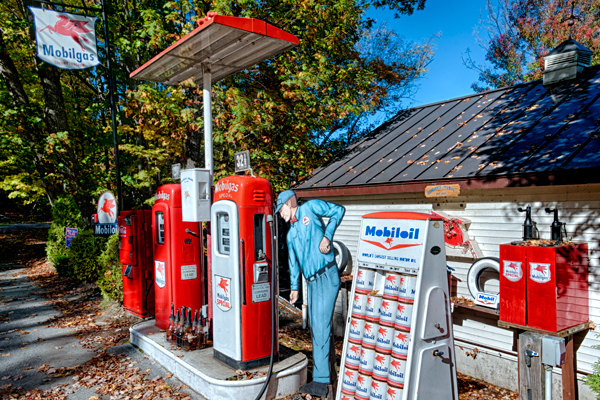 I think this was in Vermont and the owner said it was a replica of his first gas station. This was at his house right along a back road. 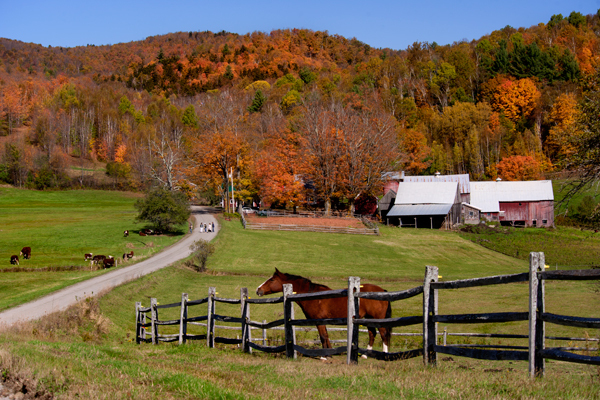 Fading fall foliage provides a backdrop for this lone horse in Vermont. Fall foliage adds a touch of color to this Mount Auburn scene. A bit of flash adds an accent to brighten the stones. 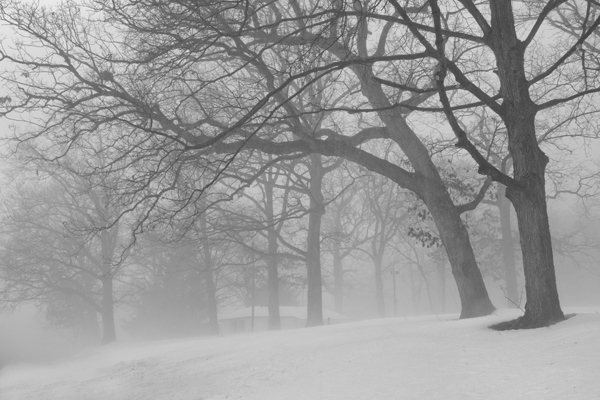 A grove of trees becomes a place of mystery as fog envelopes the landscape. Do you dare wander in to find what creatures lurk just out of sight? This monument was completely in the dark until I illuminated it with flash. Doing so allowed the texture and inscriptions to reveal themselves. I must thank my friend Morrie who helped keep my camera dry under an umbrella while I moved around the structure with the flash. 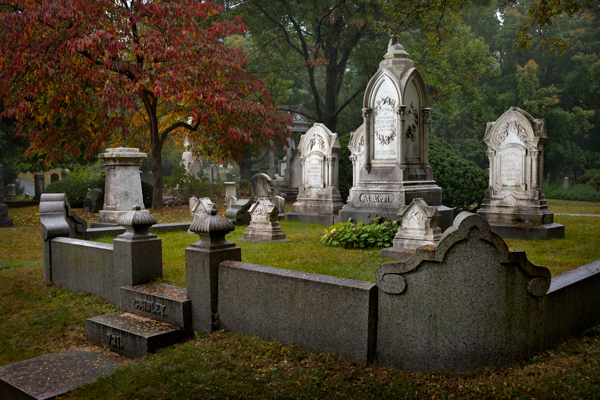 Often, monuments and mausolea are designed by the same architect who designed other residences for the family. The Mary Baker Eddy monument does not follow that mold, instead, it was the result of a design competition. Egerton Swarthout, a New York architect, won the competition in 1914, with a tholos form design of a circular colonnade consisting of 8 columns each 15 feet in height. Swarthout omitted a roof because he felt there should be “nothing between the grave and sky but flowers”. Originally, the architect specified the monument be constructed of Colorado or Vermont white marble. As an acknowledgement to the harsh New England winter, Bethel, Vermont, white granite was substituted because it withstands the elements significantly better than marble. 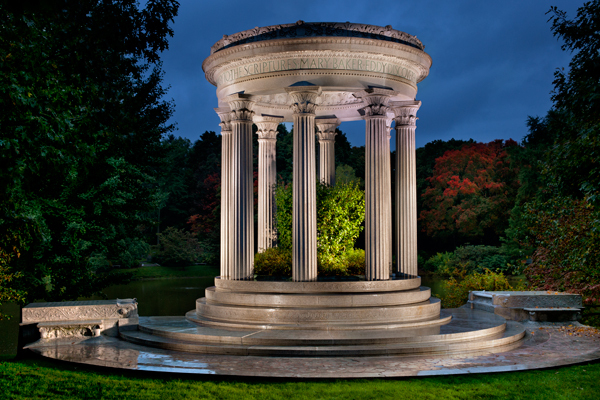 The Mary Baker Eddy monument has been acknowledged as one of the finest examples of the granite carver’s craft. Among the details incorporated into the design are the wild rose, which was Mrs. Eddy’s favorite flower, the morning glory, which opens to the light and closes to the darkness, the lamp of wisdom and a sheaf of wheat.